Some of you may have heard of Sneaky Pete. Google searches are attempting to locate this character. MyLife is sending Spam emails to Sneaky in order to steal his security codes for the restroom at Starbucks. Well folks, here is a little story about Sneaky Pete. You may know the fella. He is not me. I am not him. Really. 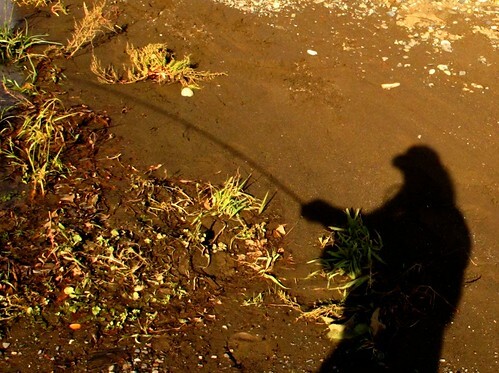 A: Rob Russell calls Sneaky Pete during salmon season. 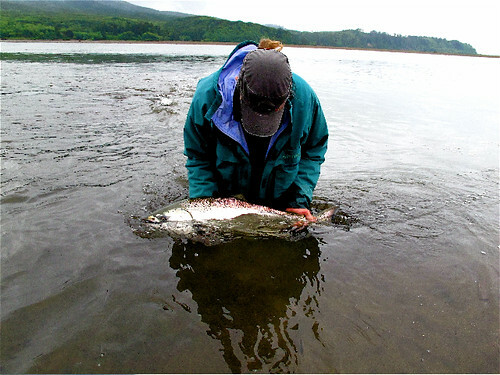 this could be any month of the year except Thanksgiving Day and Christmas Day, which are off-limits to salmon fishing. The conversation usually develops along these lines. Rob: whtchyabeenupto, Sneaky Pete? Sneaky Pete laughs, Rob laughs, and then SP spills his guts. Then Sneaky swears Rob to secrecy. Sneaky Pete and Rob conclude the phone call. Sneaky Pete then fields or makes phone calls from or to Guido, Jeff, the other Jeff, Nate, Steve, Jack, Jim, and Bob, spilling his guts to each and swearing each to secrecy. Meanwhile Jeff calls Jason, Guido calls Jeff, Jeff calls Jeff, and basically, everyone calls everyone else. Each call is consummated with traditional who-do-you-think-you’re-foolin’ asking for and receiving of secrecy swearing. Dire consequences are promised including but not limited to Internet postings and Blogging of each respective caller’s secret fly waters, patterns, and underwear color and style (if any) if any one should anyone violate sworn secrets. Exposure of personal dirt is established also as fair game if puking of “secret” should occur. Meanwhile, the seven salmon that were holding in the one pool where Sneaky Pete actually caught a fish have moved about twenty-five miles upriver. The following day, all three hundred-and forty-seven of the persons who heard about Sneaky Pete’s one fish descend on said fishing hole in prams, drift boats, pontoon rafts, belly boats, 27’ inboard Jet Sleds, helicopters, sea-planes, and Oil Tankers. All persons gaze at each other and at their respective belly buttons (neatly hidden ‘neath their Simms Guide Waders), feign innocence, start laughing, drink much Tequila, and pee in their waders. Upon returning home, all 347 salmon fishers collect every salmon rod and shooting head in their den and start shoving each and every one into various handy garbage disposals, fireplaces, leaf shredders, and lawnmowers, tip first, vowing to fish only for trout, evermore, no matter what. One week later, all 347 “reformed” ex-salmon-flyfishers sneak down tothe Caddis fly and purchase several complete outfits – except for Sneaky Pete, who had refrained from trashing seventeen of his favorite fly rod, reel, line combos and is already back at the pursuit of the silvery Unicorn on the Oregon coast. This entry was posted in Fly Fishing Glossary, Oregon Salmon fly fishing. Bookmark the permalink. Thanksgiving and Christmas are NOT off limits. Best fishing days ever. I would agree with Rob. Thats a nice read! p.s. I talked to SP a minute ago and he said the tuna moved up the Deschutes and are feeding on Nate’s softshell crabs! I’ll be leaving the dock tonight at 2am for an offshore run so Sneaky Pete cant call me tomorrow to complain about giving up his “secret”! Your secrets are (not) safe here in the Northeast!